Allow me to now ignore the AP Top 25, The USA Today, and any other poll in college football, the BCS poll is IN! Naturally, I want to help you clarify some things, and in the process get on my soapbox! Getting after it . . .
Maybe the Gators aren't #1? I've been the biggest supporter of Florida since the preseason hype, but doubt is now starting to filter in. While the first BCS poll of the season has the Gators at the top, you have to raise an eyebrow after their performance on Saturday. An unranked Arkansas team took the Gators to the wire (23-20), for all intents and purposes the Razorbacks had their chances to drop Florida at Ben Hill Griffin. While there is little doubt the Gators have a signature win or two on their resume, that same Arkansas team was handled by the BCS #2 ranked Alabama Crimson Tide, 35-7. The BCS is showing a ton of love for Tebow & Co. right now, however, a few more close calls like this past weekend and it won't be long before Nick Saban has Alabama at the top of the mountain. Final thought: If Alabama lays the wood to Tennessee this weekend, a team which lost by only 10 to Florida, it'll be hard for any poll to not make Alabama the top ranked team. Boise State could slip in the back door. At first glance, why not? The teams in front of them at this point go like this: Florida, Alabama, and Texas. Florida and Alabama are on a crash course for the SEC championship game, like it or not one of those teams will finish the season with 1 loss. Texas still has a trip to Stillwater, and a home game against a tough Kansas Jayhawks team. A recent lackluster performance against a Sam BradfordLESS Sooner squad and a bad first half against Colorado a week ago, show chinks in the Longhorn armour. 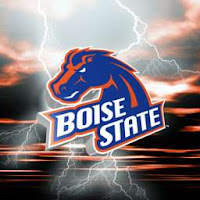 If the Boise State Broncos are BCS championship game bound, they've got to win out and do it impressively, the only way they slip in is if they remain undefeated, no doubt. I like Boise State and their chances, the way this college football season has gone this would fit right in. Final thought: (1) Oregon, who lost to Boise St., has to beat Southern California in Eugene on Halloween. (2) An undefeated Big 10 champ has a stronger case. (3) Can Tony Pike & Cinncinati win out? That is the question. ranked tied team. In this case, the head-to-head results of the top two ranked tied teams shall determine the representative in the ACC Championship Game) If the season ended today, the Hokies of Virginia Tech would be out, and the Hurricanes they beat, in! Not only did the Hokies get beat on Saturday, they may have cost themselves a shot at both the ACC crown and another trip to the Orange Bowl. Fear not Hokie faithful, the road in front of Georgia Tech & Miami isn't an easy one. The Hurricanes will welcome Clemson to Miami this week, feisty Duke and Virginia in later weeks, no napping for Randy Shannon. That fast Georgia Tech team has three conference games remaining on their schedule, but would anyone be shocked if they were knocked off by Virginia next week, that's ACC circa 2009? Final thought: While I believe Georgia Tech is the best team in the ACC, right now, I have no doubt their 33-17 loss to Miami will haunt them more than they ever imagined. Thank the BCS for that. Should we now root against Iowa? Does anyone really want to see Iowa in the National Championship game? I'll go one step further, who really wants to see ANY Big 10 team in the title game? With Ohio State being upset by Purdue this past weekend, and Penn State having a Hawkeye loss on their resume, we've got no choice left but to hope someone knocks off that Iowa team which is currently undefeated, right? Wrong. Breath easy Big 10 haters, we've got a Bearcat in our back pocket. Lead by their tough as nails Heisman candidate, Tony Pike, the #6th ranked, 6-0, Cincinnati Bearcats can help us with this one. While Iowa has just 1 remaining game against a ranked opponent, Ohio State (#19), the Bearcats have two against #23 West Virginia and #20 Pittsburgh. Pair two victories in those games with their wins in Corvallis and South Florida, and you've got a resume better than any of the Big 10's best, even Iowa. Final thought: I've seen Big 10 opponents, mostly Ohio State, in big games against other conferences, it isn't impressive, it's big, slow, and boring, much like every week in the Big 10. I have alot of respect in 2009 for the Big East, and so does the BCS. Be prepared for the BCS to be shook after this week, Clemson heads to Miami. Boise State flies South Pacific. The Big East takes center stage. Aside from your usual weekends of SEC fun, this weekend should shake things up! What else is new?